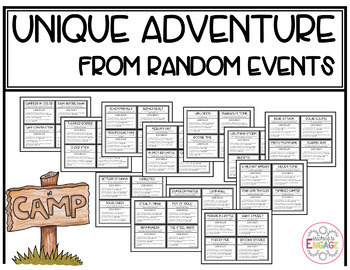 This "Escape the Room" resource is designed for groups of students to work together to find and solve different degree activities throughout the classroom. Each activity awards a piece of camping gear. The gear will be used when students draw an event card that either helps or hurts their team, or camp. This activity is themed like a survival virtual reality game where students are beta testers and trying to survive the experience. 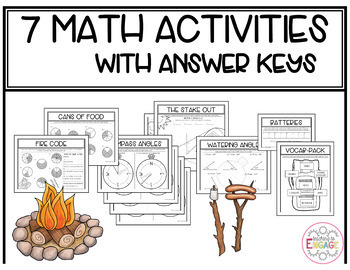 Please not that this resource does involve quite a bit of PREPARATION TIME due to the type of activity (escape the room) and the number of activities (six). 7 Activities: This resource asks students to solve seven different mathematical activities that involve comparing and equivalent fractions. 1. Fire Code (Fractional Part of Circles with Turns) - This requires students to determine the fractional part of the circle and turn of 8 models. 2. Cans of Food (Degrees) - This activity requires students to determine the degrees of the fractional part of the circle. 3. Compass Angles (Drawing Angles) - This activity awards requires students to draw angles based on the directions for each compass. Each compass has one direction already drawn on, and needs students to draw the other side of the angle based on the instructions (i.e. go 30 degrees East). 4. 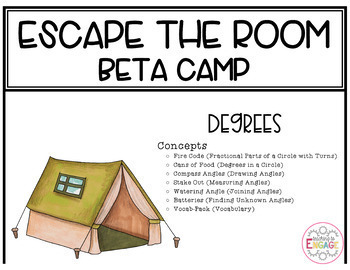 Stake out (Measuring Angles) - This activity requires students to measure several precise angles on tents. 5. Watering Angle (Joining Angles) - This activity requires students to join angles together to a specific degree using a given angle and one or two dominos. 7. Vocab-pack (Vocabulary) - This activity awards requires students to match vocabulary words and their definitions. They do this by placing the defintion on the correct word on the game board.